This Sunday was a lot of fun! We really enjoyed shooting for a beautiful young Russian couple, Elena and Ilya. This is was their first experience with a professional photographer and they handled it really well! We are started early morning around 6:45 am, with make-up and hair for the bride (by Elena Volkova). The process took about 2 hours to make it look perfect. The groom, Ilya, is a pilot for an airline in Russia. 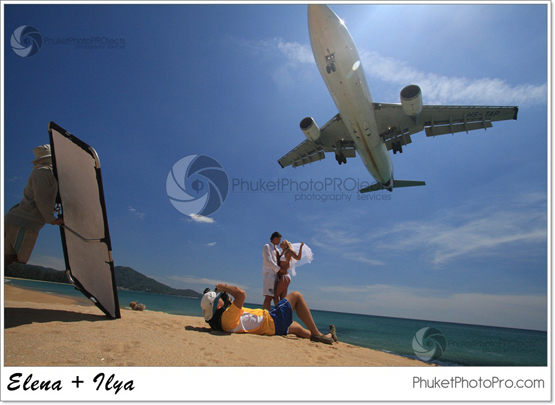 That’s why our first destination was the beach right near Phuket Airport. The weather was perfect and we were lucky to catch a few planes commencing their landing sequence! This was a special treat for Ilya and he really enjoyed it. The shoot continued until 8:30 pm. The couple was happy, but tired when we brought them back to their hotel. The next day we gave them a slide-show demonstration. They could not believe it was them on the photos! They was so happy and emotional. They hugged and kissed each other as saw the pictures, still in disbelief! We did a great job, met some wonderful people and made a new friends. 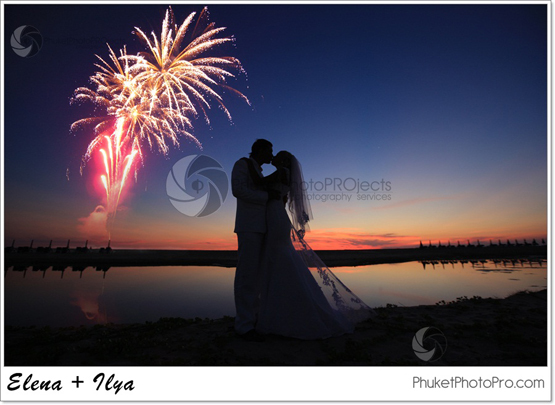 A good day for Phuket Photo Pro.